We cannot protect our children from everything. However, we can provide them with the tools to make sound decisions. As my daughter rapidly approaches the preteen years, I am a little nervous about what those years hold in terms of her self confidence. I navigated those years pretty easily without too much worry about what others thought about me. Of course, I did give in to preteen and teen impetuous shopping trips. But, over all--those were great years. However, my daughter is not me and I hope that I have given her the tools she needs to soar during those years. I think that we can really lay down the foundation for our daughters to enjoy their uniqueness as well as that of others at a young age. Recently, I learned about Addie B. Strong, a new children's series started by another concerned mother, Alyson Flippo. Frankly, I have seen even the youngest children at my daughter's elementary school face criticism and peer pressure. It is crucial for children at any age to realize that they each are strong in their uniqueness. Addie B. Strong - I Am So Strong speaks to these young children and inspires them in words that they understand. Concerned about when her own daughter faces societal pressures, Alyson shares her inspiration for Addie B. Strong: "We want to help inspire our girls to see that they are amazing, not because of how they look but because of what they can do; that fashion models are not role models; that the only person they need to impress is themselves; that the sky is not the limit and that there is nothing they cannot do." Addie B. Strong - I Am So Strong has a nice musical tone to it. 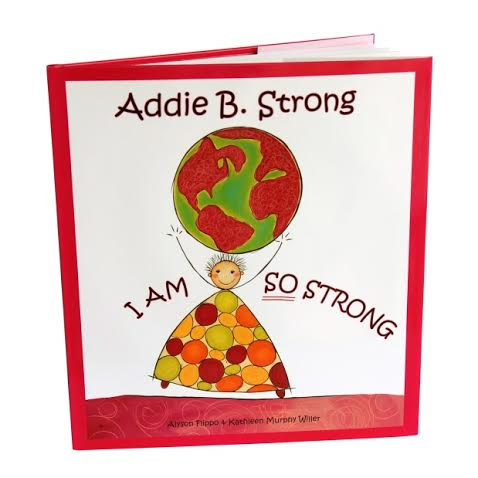 Addie's mother guides her to her own discovery of empowerment and confidence. I love how that while this book is quite simple and easy to follow, it adeptly shows this wonderful bond between mother and daughter while Addie is able to uplift herself from within. Definitely, a great message for our girls! Since this book is geared toward younger children, it is one that you can easily read with your toddler. With darling pictures, the book is a great choice for a gift. The book is written in a way that I can picture toddlers repeating it with joyful familiarity--a real way to help them take the message in. What a great way to give our youngest inspiration! seventeen. I did not realize that some of this started so young! We really need to lay the foundation for self-confidence at a young age. If you interested in reading more about Addie B. Strong or ordering a book or gift set, head over to the I Am So Strong website. Addie B. Strong - I Am So Strong is the first in this empowering series, so watch out for more from Alyson Flippo! Thanks Alyson for this great book! **Disclosure: We did receive a copy of Addie B. Strong - I Am So Strong for review purposes. No other compensation was received. All opinions are 100% my own.